If a bottle is too much for you, why not go for this shot of goodness? The star of the shot — turmeric, curcumin has strong antioxidants which can protect your body from free-radical damage . You’ll be surprised that cayenne pepper can actually help to burn calories and suppress appetite too . One shot and you’re good to go! You could also check out the Vital Shot which is made of ginger, lemon and wildflower honey . 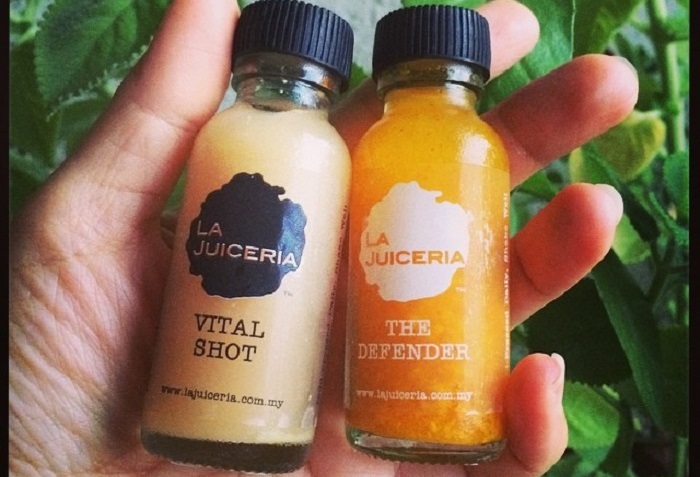 Also take a look at yoga teacher Nabilla Sharil’s La Juiceria 2-days Juice Cleanse Review. 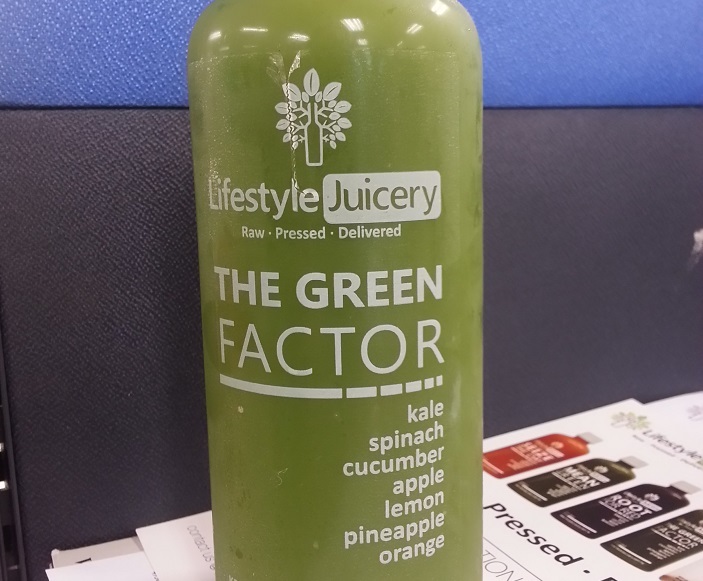 If you’re not a big fan of green juices then this could be a great beginner drink. A well-known superfood, raw kale clocks in at only 33 calories per cup and is a great source of Folate, a vitamin B that’s important for brain development . Pineapples included in the juice are rich in vitamin C and bromelain, which helps to reduce mucus in your throat and nose when you’ve caught the flu bug . 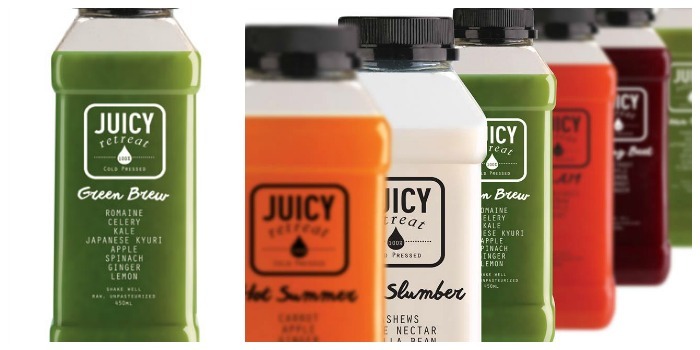 Other than the green juice, you can try Lifestyle Juicery‘s Seize The Day juice. Carrot, orange, celery, pineapple, apple and parsley make up this yummy juice to start your day! This fuschia concoction derives its colouring not from synthetic sources, but the dragon fruit. Besides being brightly coloured, dragonfruit is also good for your bones and blood, thanks to its calcium and iron content  . Another superfood included in the smoothie is the avocado, which has a high amount of monounsaturated fats. Not to worry, these fats are “good” fats that help lower your bad cholesterol as long as you eat or in this case, drink in moderation . We think you’ll love Wellness Inc‘s Reset too, as it is made out of Himalayan salt, rosemary, pineapple, mango, yellow pepper and lemon. The drink tastes just like the tropical punch you get during vacays but with better and healthier ingredients! 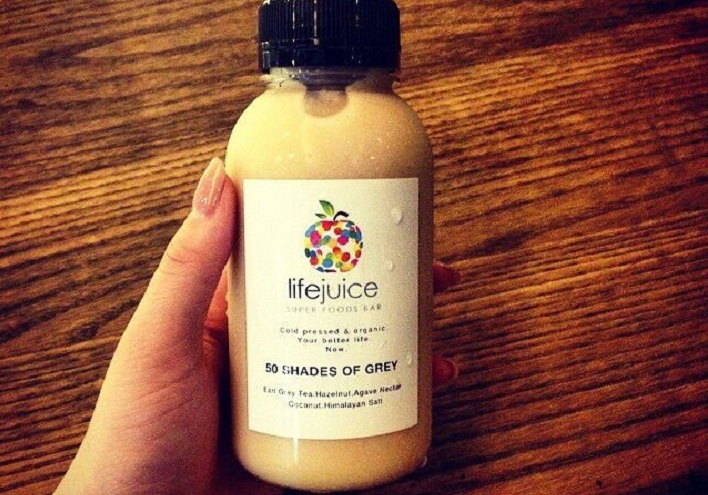 We can’t get the 50 Shades of Grey books and movie here but we can have this juice. The unique use of Earl grey tea in a juice? That’s different and also the tea provides hydration to your body because of its high potassium content . A good drink to de-stress with, we say! 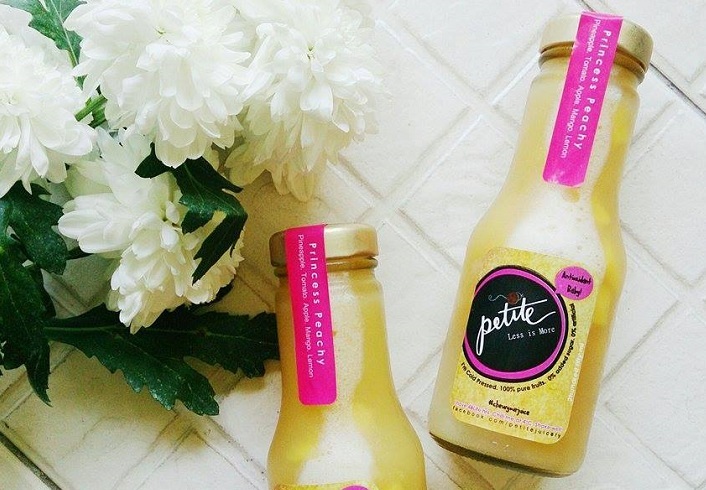 LifeJuice Co also won the Best Cold-Pressed Juice in Malaysia award last year, awarded by TallyPress. So what other juices you should try from them? The Salad In A Bottle is a yummy green juice and so is the 500 Days of Summer. They’re really inspired by the movies, don’t you think? Beet or beetroot have numerous health benefits for your body. However, you might notice that your pee or poop might have a slight reddish tone if you consume too much beetroot. That could be caused by the flavonoids in the beetroot called anthocyanins which can help your body to recover after exercise and reverse the effects of pollution on your body . 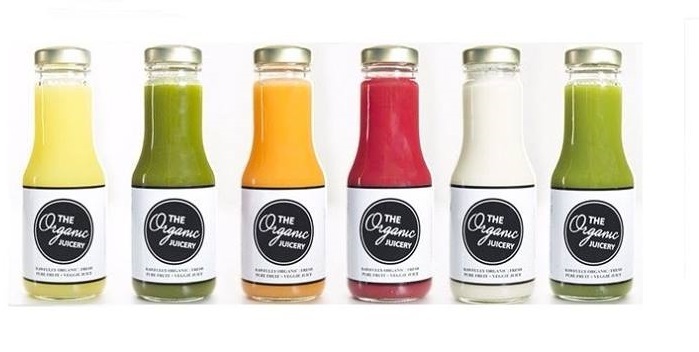 Try out the Spicy Lemonita (First bottle from the left) from The Organic Juicery, it’s a combination of lemon, agave, and cayenne pepper. However, you can only keep their juices for 2 days max since it is made raw and unpasteurized. Strawberries are known for their numerous benefits especially for your skin so we guess that’s why they named the juice Glow Inside Out. The strawberries in this juice can actually help to prevent signs of aging because it is rich in phenolic flavonoid phyto-chemicals called anthocyanins and ellagic acid . We think this will be a nice sweet treat after your meals. 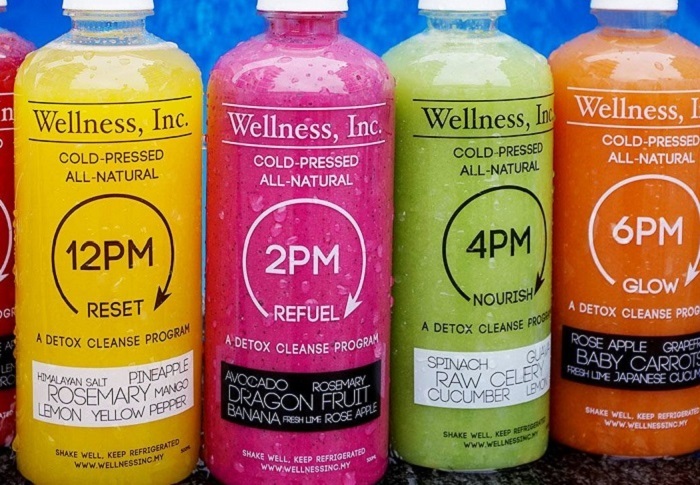 Also, if you’re battling a hangover, give the Adios Hangover (5th bottle from the left) from Juice Me a try! It’s made with cucumbers, lemon and honey which will help replenish the water you have lost. For the green juice lover, we think this is one to add into your refrigerator. The addition of herbs such as parsley and mint definitely brings this juice to a different level. Parsley gives a good amount of vitamin K to your body which can help improve calcium absorption and bone health . 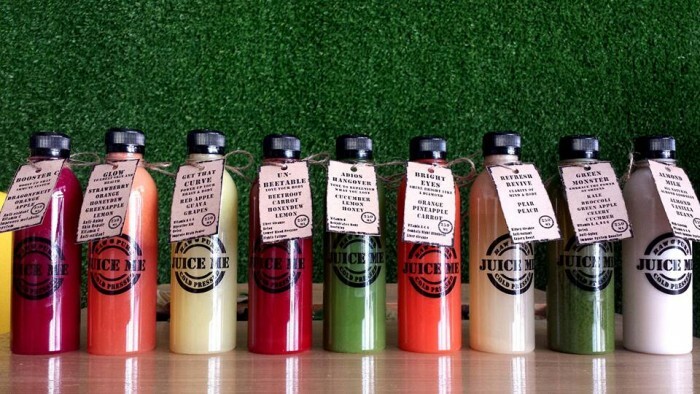 Founded by juice fanatics, Juice Meds raw and cold-pressed juices can be found in Ben’s Independent Grocer at RM28 per bottle but you can opt for delivery too if you are staying in the coverage areas. Apparently, these fly off the shelves pretty quick so follow their Facebook for restock updates. A sip of this will make you feel more peachy! But you won’t find peaches in this bottle. Instead you’ll be able to chew on some mango cubes which is a nice change from the fine juices with no texture. It’s just like bubbles from bubble tea but in mango cubes. Petite Goodness called this the Anti-Aging juice because of the great amount of antioxidants that you can get from the ingredients, especially tomato. Tomatoes are full of vitamin C, which is what our skin’s support system aka collagen needs to protect our skin from damages from pollution and wrinkles . If you’re hoping to get fairer skin, you could try out the Frisky Frog, made from kiwi, apple and lime. Or go for Yellow Submarine which consists of pear, apple, orange, lemon and chia seeds. Chia seeds have numerous health benefits! If you have never tried a Smooshie before then you’re missing out! 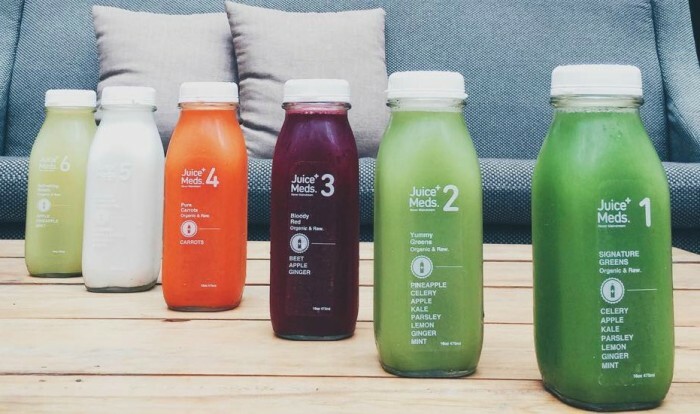 The juices are made using centrifugal juicers but after the juices are made it is processed through HTST (High Temperature, Short Time) to destroy pathogens and give it a longer shelf life. The added lemongrass in the juice has a diuretic effect which helps you to expel toxic waste from your body . There’s not much evidence on the health benefits on rambutans yet but we know that rambutan makes the juice sweeter naturally. 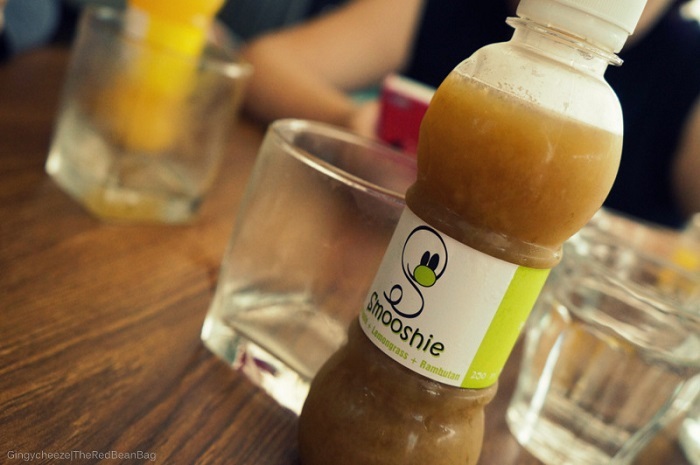 What we love about the juices is that there’s still pulp in the juice which means you’re getting some fiber intake too! Also, each Smooshie bottle covers 2 of your 5-a-day serving of fruits and vegetables. 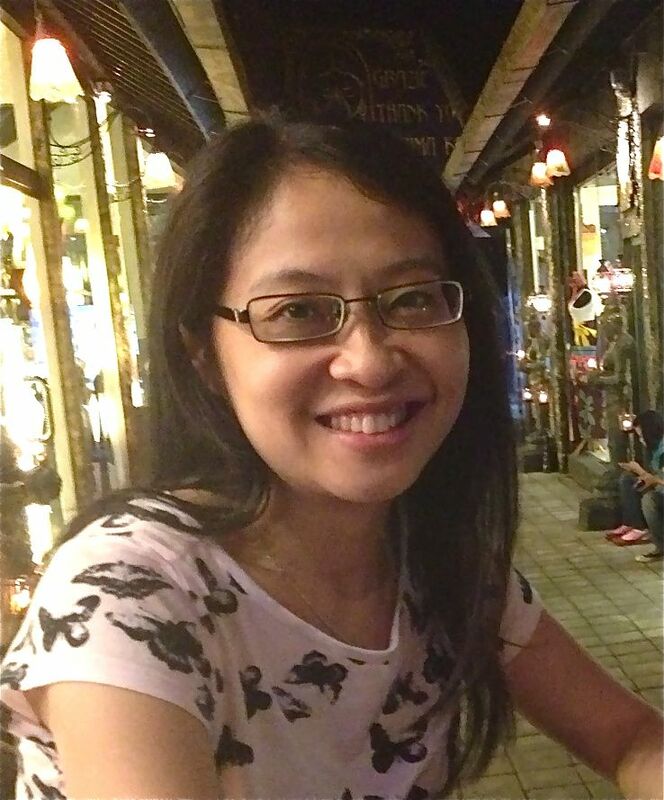 Healthy green tea latte? Yes please! Drinking almond milk can help to lower your cholesterol because it contains heart-healthy poly- and monounsaturated fats. Almond milk is also free from saturated fat, trans fats and dietary cholesterol . We also did our research on the benefits of green tea which you can check out here. Strip Juice sometimes sell seasonal limited edition fruit juices and they currently have Freshly Pressed Peach Juice on sale. Get it before it’s gone! We end this list with this green juice that has some unique ingredients such as romaine and japanese kyuri which we didn’t see in other juice companies. Romaine lettuce has high water content and that will make you feel fuller faster so you will eat less . Japanese kyuri or japanese cucumber is thinner than their western counterparts and is usually eaten raw in salads or pickled . Since it’s part of the cucumber family, it is also full of water which can help to hydrate your body. 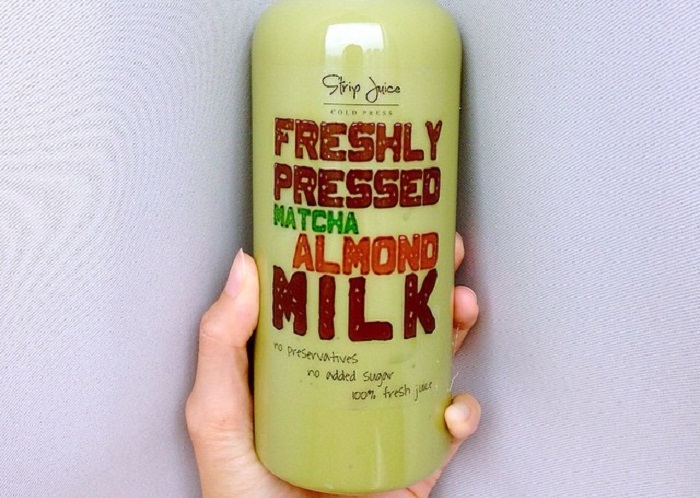 Juicy Retreat has a milky concoction called Milky Slumber which is made from cashews, agave nectar, vanilla bean, cinnamon, Himalayan salt and distilled water. Juicy Retreat recommends you to drink this at night as a meal replacement for dinner, but you can definitely have this with a small side of salad to fill you up! Have any juice favourites to share? Leave them in the comments below or on our Facebook page! 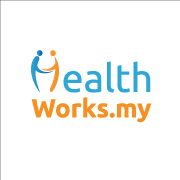 Hi there, thanks for the great review, we here at Lifejuice appreciate the support. Cheers to a better life!